You really need an iron skillet to make this, but if you just don’t have one, a nine inch square or round cake pan will do. Get your large iron skillet, or 9″ pan and put the margarine in it. Put the pan into the oven at 400° allowing the margarine to melt, and the pan to heat. In a large bowl combine the buttermilk, eggs, sugar and salt. Use a whisk to mix it up really well. Pour in the melted margarine, leaving about a tablespoon of it left in the hot pan. Be careful pouring so you don’t get burned. Beat everything up again. Finally add the cornmeal, flour and baking soda. Whisk again until the batter is mostly smooth. Turn the batter into the hot skillet or pan, on top of the little bit of margarine you saved in it. Carefully put the skillet back into the oven. Bake the cornbread at 400° for about 25 minutes. It will be golden brown and the edges will pull away from the sides of the pan. Remove the pan from the oven and let it cool a little while before slicing into 8 or 12 wedges. The iron skillet gives this cornbread the traditional crispy hillbilly crust. Another pan will still cook it, but it will not be quite the same. The buttermilk and sugar make the cornbread very tender and sweet. A perfect accompaniment for spicy dishes like Chili and stew. 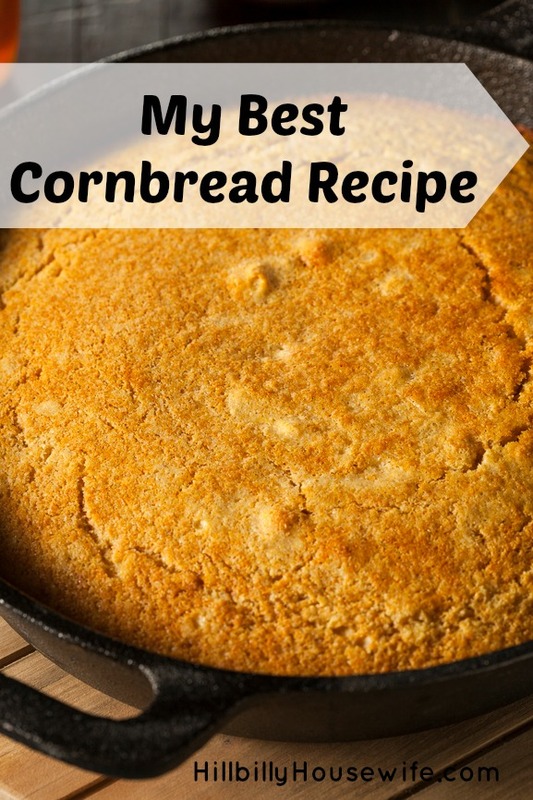 This is the best cornbread I have ever eaten, there is another recipe though, of a heartier and coarser nature, which is a little easier to make, Plain Cornbread.